Overcoming a tragedy from his life as a firefighter, Logan needs a friend. Thank goodness for Amy. But when a woman from Logan's past resurfaces right as some anonymous letters se dnd Logan's pulse hammering, suddenly he doesn't know what he needs—a reliable friend, or a passionate lover? One smoking-hot kiss could change everything…but will it ruin a one-of-a-kind friendship, or show Logan and Amy that they've already found everything they need, right here in Destiny? Logan and Amy's story had been a long time in the making, one readers had been waiting for, and because I already knew both characters so well by the time their book rolled around, it practically wrote itself. The only problem I encountered while writing this book was that so much was happening with so many characters that it was a lot to squeeze in. That said, all the external events really kept the book rolling – never once did I have to stop and think: What now? ; ) It was an extra bit of fun to write the secondary plot of this book, as well, because it had also been time coming, the origins going back to Book 2, Sugar Creek. From a "heart" standpoint, I must admit to feeling unusually connected to Amy's story – I was very invested in all the ups and downs of her emotions and very much feeling them along with her, and I hope that comes through and results in making it an extra-emotional read, especially for long-time fans of the series who have known Amy nearly as long as I have. 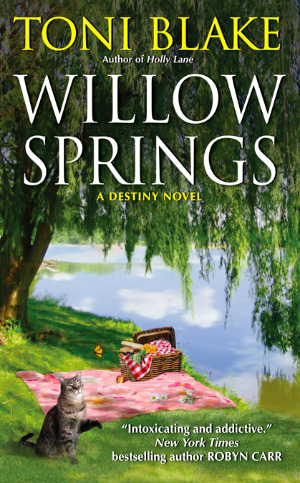 Catch up with Toni and get behind the scenes info on Willow Springs in the Publisher's Weekly interview, Every Sort of Mischief: PW Talks with Toni Blake.